"I feel like I've been in a strange dream." FUNimation has released an official US trailer for the upcoming US release of the Japanese anime hit film Your Name. You've probably heard about this film already, or at least heard the name before. Your Name opened in Japan last August, and went on to become the highest-earning Japanese film ever globally. It made over $230 million in Japan alone, playing in the #1 spot for 13 weeks, making it a sensational success in Japanese cinema. The film is finally about to open in US theaters this spring, and there's a new trailer with subtitles below to watch as an introduction. There is an English-language dubbed version of the film being released, but we always prefer the original version with subtitles. Featuring the voices of Ryûnosuke Kamiki, Mone Kamishiraishi, Ryô Narita and Aoi Yuki. Enjoy. Mitsuha and Taki are complete strangers living separate lives until they suddenly switch places. Mitsuha wakes up in Taki's body, and he in hers. This occurrence happens randomly, and they must adjust their lives around each other. Yet, somehow, it works. They build a connection by leaving notes for one another until they wish to finally meet. But something stronger than distance may keep them apart. 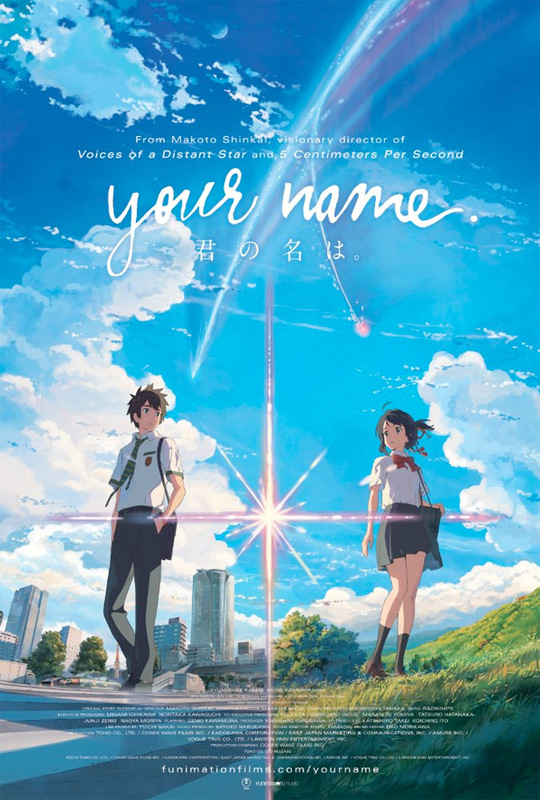 Your Name is both written and directed by filmmaker/writer Makoto Shinkai, of the films Voices of a Distant Star, 5 Centimeters Per Second, Children Who Chase Lost Voices, Someone's Gaze, as well as The Garden of Words previously. The film is based on Shinkai's own novel. It already opened in Japan last August, and also played at the London and Stockholm Film Festivals. FUNimation opens Your Name in select US theaters starting April 7th this spring. For more info on the release, visit FUNimation's website here. Interested in this film?